Penhelig harbour, Aberdovey, mid-west Wales… a typical seaside scene (lots of fresh white paint) with a 7-stop brightness range handled well in a 2-bath developer. The name of Heinrich Stöckler will be familiar to most Leica enthusiasts and readers of early Leica literature. He went to Leitz Wetzlar in 1929, set up a department for instruction in the then “new miniature” photography techniques and eventually became head of The Leica School. In 1938 and 1939 he wrote two articles on “2-bath” film processing for “Leica News and Technique”. In 1947 he went on to become the first editor of “Leica Fotografie International”… a position he held until 1973. So far, the man… now, the medicine! I see and use many different films and developers and whilst it can be said that nearly all combinations work to some degree there are few that are suitable for all subjects and situations. The reason why is that old devil contrast. 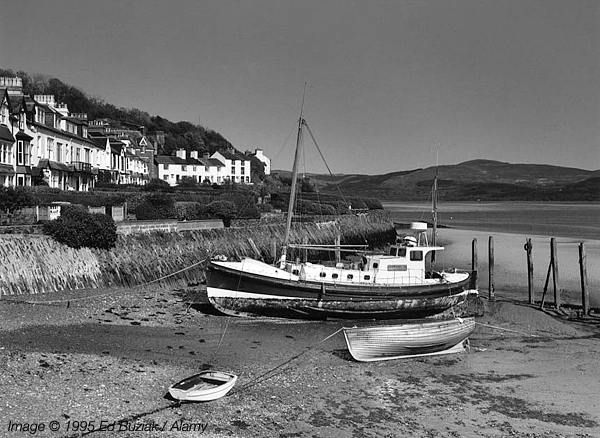 In ideal circumstances the contrast range of a subject would be that of black-and-white film… about seven stops as seen in the above image of Penhelig Harbour, at Aberdovey on the coast of west Wales. But life is not often like that when we’re out with our cameras. Drab winter weather may present a contrast range of only three stops whilst in the height of summer it can be up to ten stops difference between the deepest shadows and brightest highlights. With a film in your camera for days or weeks both extremes can occur… so ideally, high contrast scenes should be isolated and photographed with one camera and film combination… lower contrast scenes with another. However, Heinrich Stöckler recognized these symptoms and formulated a developer that addressed the problem in a different way. He divided the process into two stages… or two baths. The first developer bath was made up from the common photographic chemicals Metol and sodium sulphite which had minimal developing action on the film… it was simply meant to soak into the film. The second bath consisted of Borax… the accelerator. Once this second bath came into contact with the first developer, which was already soaked into the film, it acted accordingly. In the heavily exposed highlight areas of film the silver halides quickly absorbed the energy of the developer and ceased development. The lesser exposed shadow areas kept absorbing the developer’s energy until it was theoretically exhausted. This of course had the advantage of developing the low tones to their fullest extent whilst preventing the high tones becoming impossibly overdeveloped… and thus difficult to print. Stöckler’s 2-bath developer is available commercially under various trade names in different countries. It is a developer more photographers would use if it wasn’t for uncertainty when mixing it. There is occasionally a problem dissolving the constituents… the first Metol/sulphite solution is difficult to dissolve completely unless the water temperature is sufficiently high. With the second bath the quantity of Borax specified for the amount of water will usually reach a “super saturated” solution and crystallize in the mixing vessel or storage bottle. Most instructions do not answer this problem… the remedy is to double the amount of water for the stock solution and subsequently dilute the second bath by half the recommended quantity when preparing for use. An important factor in film processing is the time/temperature relationship. Often too little attention is paid to this… some photographers being happy if the negatives show anything despite the problems then encountered printing them! Whilst not supporting such inconsistent methods, perhaps Stöcklers 2-bath was unintentionally designed for them because it is so forgiving. For example, whilst the developers instruction sheet describes the time and temperatures necessary to achieve consistent results, it does not mention that because of the characteristics of 2-bath developers there is actually no need to be precise. However, the first bath should cover the film and have intermittent agitation for three to four minutes… after which there will be no more absorption of chemical by the gelatine emulsion layers. Also, since the second bath is only accelerating the developer from the first bath, once it has reached finality, no more development can possibly take place and the film cannot be overdeveloped if the time is extended. Nevertheless, the temperature of all processing solutions, including the stop, fix and wash should be the same in order to avoid possible reticulation – or mechanical clumping of the grain. Of particular advantage to monochrome workers who like to use different speed films from different manufacturers is that all slow, medium and some high-speed films can be processed together for the same time… 4 minutes in each bath. This is a revelation for many photographers in the darkroom. Gone are the complex time/temperature and dilution charts for different films (even different between format sizes) although some reservations should be made. Some high-speed films do not take to this general development technique… but from personal experience all slow and medium speed films from the ISO 25 to ISO 200 range work with absolute certainty. Whilst this apparently casual approach to film development is not intended Stöckler’s 2-bath technique is a forgiving one. What must not be done, however, is for the first bath to be contaminated with any chemical from the second bath. And note… there are no intermediate washes or use of a stop-bath between the two which would completely negate the compensating effect of the process. The big question after any film developer is tried for the first time is how well do the negatives print. The unreserved answer with Stöckler’s is very well indeed. Time and effort previously spent with complex repeated exposures dodging and burning-in difficult parts of a negative are becoming a thing of the past in my darkroom. With today’s 35mm films, which are mostly fine-grained, enlargements show many of the qualities associated with larger roll-films. It would be rash to dismiss the larger formats because they will usually, given similar handling, produce a smoother tonal range. But there are many Leica users who can show prints that are indistinguishable from those made from roll-film negatives. Those who cannot do that would be well advised to invest in a packet of Stöckler’s 2-bath. Currently, Silverprint (London, UK) have Tetenal Emofin and Resofine 2B listed on their film developers / 2-bath page. Resofine 2-B was designed by the late Ron Spillman – whom I visited frequently in Shrewsbury in the 1990s – and is now produced by Speedibrews as a 1-litre powder pack with high capacity and comes highly recommended.